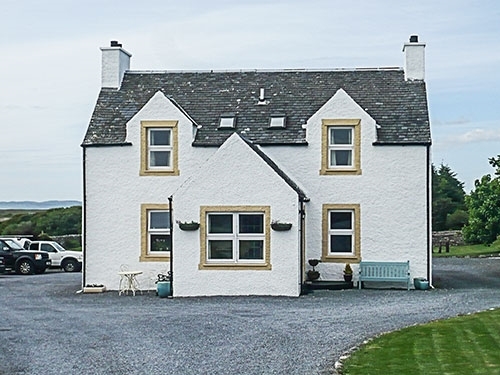 Alasdair and Rachel Whyte would like to welcome you into their home at Glenmachrie House, a traditional farmhouse built in 1898 and surrounded by 450 acres of green fields, loch, river and heather clad moorland. Glenmachrie lies four miles north of southern ferry port of Port Ellen and six miles south of the island's capital, Bowmore, and is an ideal setting for a memorable hebridean holiday or for that very special occasion. Glenmachrie is within easy walking distance of the Big Strand (miles and miles of golden, sandy beach backed by dunes) and for the golfing fraternity we are only one mile away from the internationally known Machrie Golf Links. We are proud to play host to families of Roe deer, hare, heron and otter and work closely with conservationists including Royal Society for the Protection of Birds and Scottish Natural Heritage. In wonderfully large and loud flocks, both Barnacle and White Fronted geese can be found over wintering on our lush pasture land. The garden has many places where you can sit out and enjoy the wonderful views and watch the wildlife, it may be interesting to note that 114 different species of bird have been recorded on Glenmachrie - truly an ornithologist's paradise! Free wi-fi allows you to check your e-mails or browse the internet on your own portable computer, phone or tablet as you enjoy the open peat fire in the sitting room furnished with antiques inherited by the family. A feature of Glenmachrie is that from the sun room where there are maps, a small library of books relating to Islay's intriguing past and local tourist information you are able to enjoy the sunrise over the hills of Dunlossit and Laggan Estates and truly magnificent sunsets can be appreciated as the sun goes to bed in the Atlantic. Rachel's knowledge of the island's rich, historical heritage gives guests an added advantage when visiting. Rachel and Alasdair's attentiveness to your enjoyment is unfailing, whether it is organising a distillery tour, reserving a table for dinner at one of the island's restaurants, horse riding, bike hire, a round of golf or simply helping plan your daily itinerary.